This is the most doctrinally un-orthodox book I've ever enjoyed. It taught me that I'm not supposed to trust another person's faith or apparent "walk with Christ" more than my own. Does that sound arrogant? Too bad. It isn't. If you haven't learned that lesson yet, you probably won't enjoy this book very much. And, warning: there are some hard lessons in store for you. It's time to wake up. 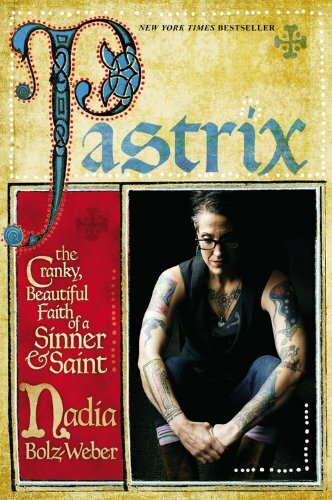 Nadia Bolz-Weber is the pastor of a Lutheran congregation in Denver called House for All Sinners and Saints. Her book is a memoir of a very unorthodox female pastor's story of ministry to a group of marginalized people that would typically not be welcomed "just as they are" at your church. I'm pretty sure they wouldn't. Personally, I find myself in a cycle where I'm questioning my faith as well as the framework of faith that has nurtured it. This book made me question it even further but it also challenged me to love God and love people more than I currently do. So where does that leave my faith? I wish I knew. Strengthened I think. It's refreshing when a book strengthens your faith in an insightfully unorthodox way. I'm pretty sure that's what Jesus' modus operandi. I haven't enjoyed a memoir as much as I enjoyed this one in years. (Watch your back Donald Miller.) Since I've invoked Donald Miller's name, I should say that if the author of Blue Like Jazz was a breath of fresh air for you, you'll enjoy this book, too. But beware; there is some adult language peppered through out. The author's self-effacing crankiness was not filtered out by the editting process. Praise the Lord for that. Also, if you like Anne Lamott's writing, you'll dig, Pastrix. The writing is clear and compassionate and punches you in the face and comes straight from the heart of a pastor.